brightspot Strategy is a management consultancy with expertise in Space Strategy, Service Strategy, and Organizational Strategy. brightspot partners with leading organizations to craft creative, achievable strategies for their spaces, services and people. They specialize in working with clients to understand their businesses and then develop briefing documents which maximize the potential of their organizations. The company, founded in 2011, has developed and expanded rapidly; with a current staff of 16, and with plans to grow to 30+ in the next 3 years. brightspot Strategy has worked with numerous high profile clients such as Google, Harvard University, the New York Public Library, and the Smithsonian Institution, to develop their work and space strategies for better employee-workspace engagement. In other words, brightspot helps its clients understand what elements and components they need in their spaces, and how to obtain these features in the most effective ways possible. In the completion of these projects, brightspot has worked with numerous architecture firms, including some of the most renowned firms in the profession. brightspot, a company with knowledge and experience, is in an excellent position to evaluate a firm, and it was an honor when they chose us to help them develop their space. 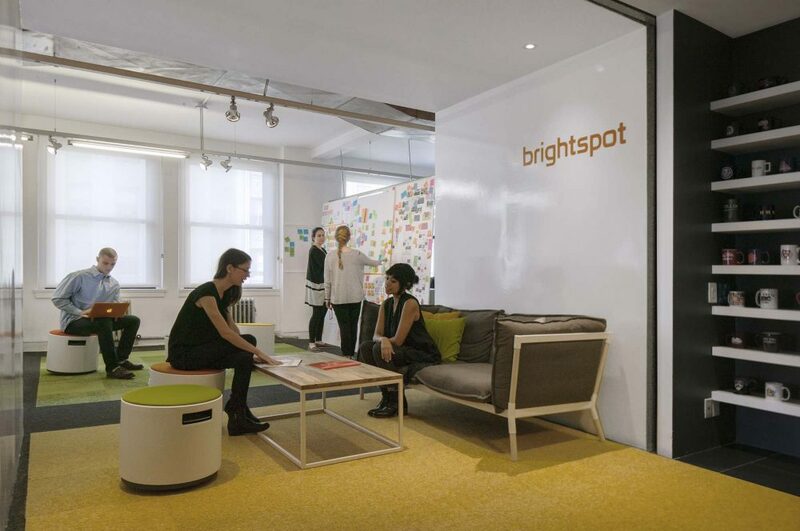 Having outgrown the spaces available to them through the WeWork shared office space platform, brightspot were looking to build a dedicated home for themselves that leveraged their own particular expertise: ensuring a space encourages people to be productive; is reflective of their values and brand; accommodates planned future growth, and a strategic plan. brightspot was provided with a unique opportunity to deploy their own services in the development of their own office space. We were approached by brightspot director Elliot Felix to work in collaboration with them during the ‘identification’ phase of the project. By being brought on board at such an early stage of the project’s development, we were able to bring our firm’s strategic thinking skills and architectural expertise into the site selection process; something that typically most firms don’t engage with. We undertook test-fits for five locations and assessed their viability against a number of criteria. Through this analysis, and extensive input from brightspot, the decision was taken to opt for an economical, unfinished space requiring more renovation work rather than a more costly finished space. The major benefit from this decision would be the chance to create and build something more aligned with brightspot’s brand that a more straightforward, established space couldn’t offer. As office and space management are major parts of their work, the intention was to use their own office as a showroom and prototype for prospective clients. From this process, a site at 30 Vesey St. was selected. An advantageous albeit unusual deal was agreed with the landlord. Whereas typical leases for commercial spaces in New York are for anywhere between five and ten years, the lease for 30 Vesey St. was considerably shorter (just under two years) as the landlord intended to lease the space temporarily before potentially moving into the space themselves. This proved attractive to brightspot; as a relatively young company having recently undergone extensive growth, they were keen to remain flexible so as to be prepared for any changes the company may face in the future. Unlikely to remain at their current size for such an extended period of time, a ten year lease would place too many limitations on the company. Parallel to the site selection process, brightspot began a process to include the entire brightspot team in a series of workshops and a pre-occupancy survey. The pre-occupancy survey aimed to examine their existing office space and identify those features that worked well, and those that did not. The survey revealed that the space created a lot of distractions, both acoustical and visual, that inhibited productivity. However, team members were eager to keep certain features they felt were beneficial to the office: facilitating collaboration and community building, and making it easy to access colleagues. The first workshop covered their existing office space, the positives and negatives the space provided, and big-picture ideas. Participants were asked to bring images of office spaces that inspired them to be shared with and voted on by everyone to help establish a direction for the design. The second workshop saw the brightspot team develop their own layouts to identify their preferred approach to desk sizes, seating configurations, and the required number of collaborative spaces / offices / quiet spaces to best facilitate their work. At this point, we took all the raw data collected by brightspot and the numerous ideas and program analyses from the workshops and began transforming them into a holistic experience, and meaningful spaces. We worked with interior designer Irina Sai to develop the brightspot team’s layouts into clear plan options from which decisions could be made by everyone involved. As a preferred option began to emerge, we made refinements and created a 3D model so that the individual spaces could be better studied and understood. From the 3D model we made simple renderings that described the spaces and integrated the interior design ideas into the actual space. 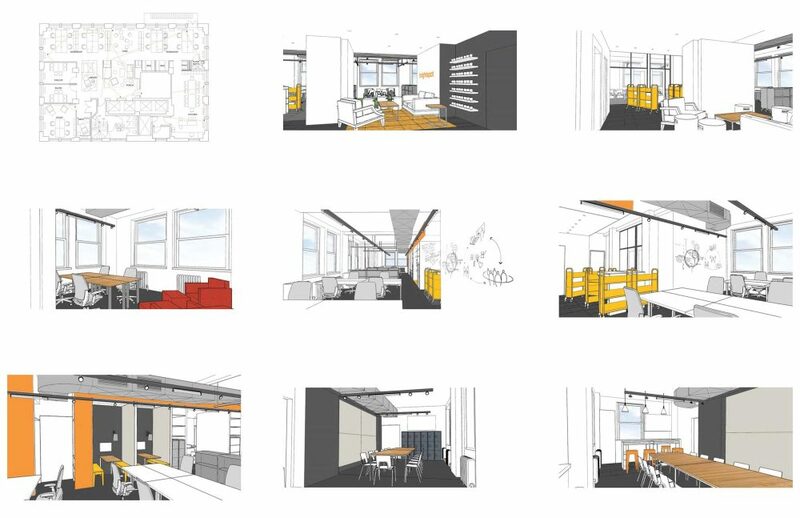 With these documents, we communicated with the client and design teams about exactly what the final spaces were going to look like, and we had detailed discussions about how it would feel to experience these spaces. In areas where this didn’t exceed or match the collective vision, we would then make changes to improve the quality of the spaces. 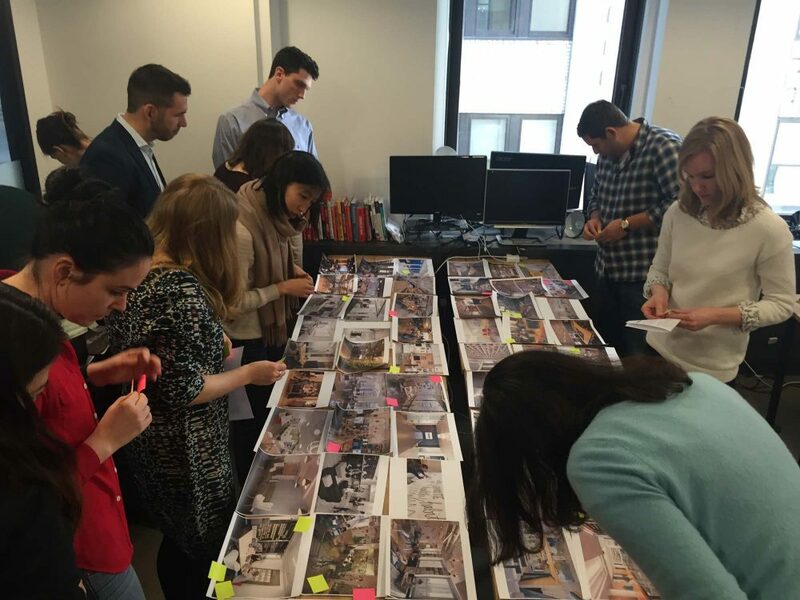 A third and final workshop, led by the architect and interior design team, introduced the final design and material selections to the brightspot team. We also introduced and described the construction process so that the full office would understand what was happening. While this process, specifically the series of workshops, was unusual for us, the democratization of the design process brought up new imagery and ideas that we may not have previously considered. It was an excellent learning opportunity, and meant that everyone had a chance to express their concerns regarding the project. Everyone involved felt they had had a hand in designing the space, and the end result was one that everyone bought into. In parallel to the workshops we brought design documents to completion and presented updates to brightpot’s management team. Meetings with this team continued through the bid and construction phases. As a vibrant consultancy company with work and clients throughout the country, up to two thirds of brightspot team members are traveling or working away from the office most of the time, while a smaller group works completely in the office with little need for extended periods of travel. It was thus conceived that the brightspot office should be treated as a home; a common, shared space that all the various team members return to or inhabit at one point or another within their work schedules. The space should be more than just an office for the company, but a welcoming and inviting space for individuals to feel “at home” in. In this way, team members would develop a sense of connection to the office, working more efficiently, and connecting more meaningfully with each other. As a result of these goals, it was necessary for the office to retain a high degree of flexibility to accommodate team members with different needs. This flexibility was manifest in maximizing the number of potential meeting spaces within the office, both formal and informal. The final design has 8 different meeting spaces in addition to the permanent work desks to support the various types of collaboration and work that takes place. Several of these meeting spaces are also capable of providing temporary individual work stations for team members who travel frequently and may wish to work individually in the office away from the group desk areas. In this way, each team member is made to feel welcome in the space regardless of their position in the team. Alongside these various meeting spaces, a number of walls are finished with whiteboard paint to allow for general communication and expression. While team members at brightspot do not have designated desks, neither does the company engage in ‘hot desking;’ the practice of using fewer than required desks and rotating their allocation to staff periodically. Instead, a more informal system is in place where desks are available to everyone, but they choose whether or not to use them. 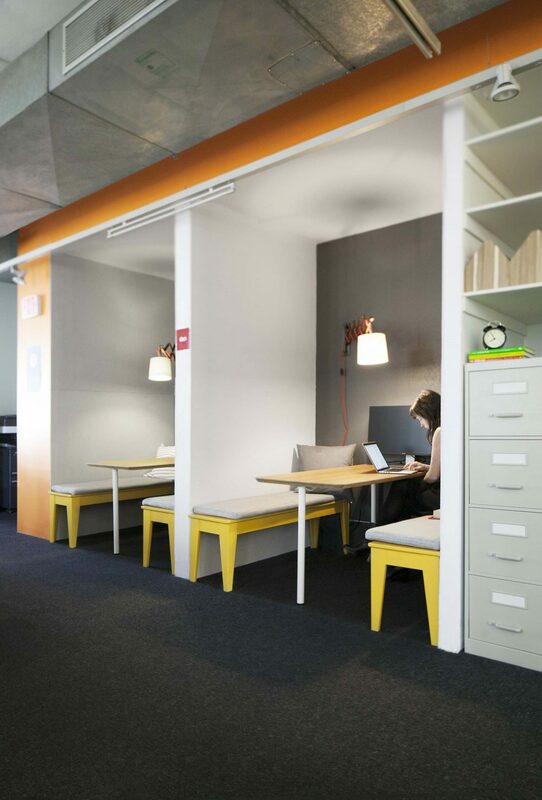 This flexibility is made possible in part by the wide variety of meeting spaces in the office, along with a designated space for making private phone calls. Our firm’s understanding of the Department of Buildings (DOB) permitting process meant that we could ensure a smooth approval process with minimized waiting times and postponements to the process. We took the decision to rebid the project after the initial bids from contractors were surprisingly high. We were confident in this decision due to a strong understanding of what was financially possible in the market, and were vindicated by the results. After moving into the new office, brightspot conducted a post-occupancy survey to understand how their team was using the new space, and if there was any room for improvements. While the post-occupancy evaluation is an ongoing process, the initial survey revealed a few areas for improvement, as well as areas that were greatly successful. Employees noticed that acoustic conditions in the conference rooms meant that noise was being transferred into adjoining spaces via ductwork. While one feature in particular, an open team meeting space, has proven to be very successful. The space has metal hangers for attaching presentation boards in a flexible, interchangeable manner. After only six months in the new space, it was decided to slightly reconfigure the furniture layout (compressing the space between desks rather than reducing the number of desks) so that another team meeting area could be built. 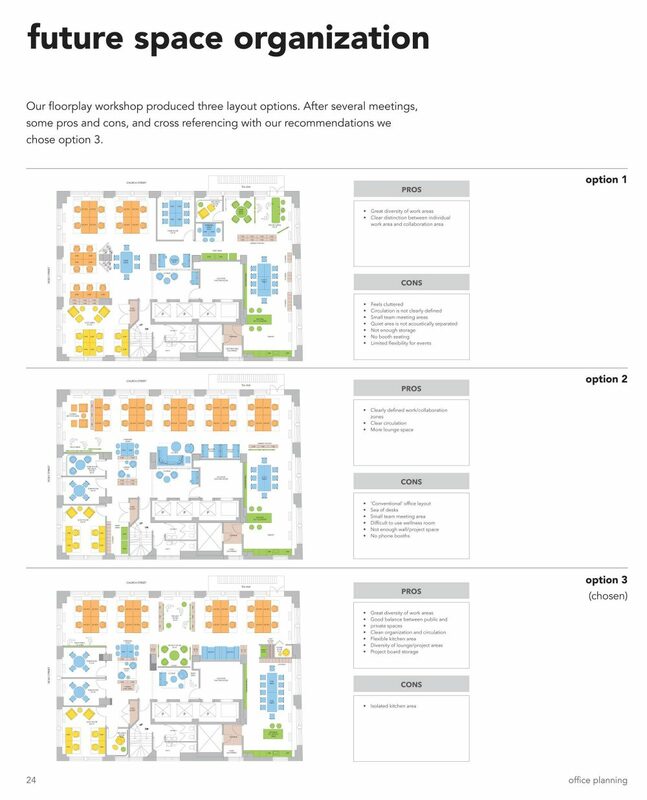 brightspot’s process of workshops and surveys places an emphasis on the end users, and creates an architectural brief that focuses on their needs. The brightspot team received a first-hand experience of their own process from the client’s perspective. Similarly, working with brightspot in their highly collaborative and inclusive way taught us a new process to designing commercial spaces with input from more sources than just the selected client representatives. However, while the process may have been new, for us, the approach was the same; detailed input from the client regarding program requirements was the driving force in the project, with us transforming this data into meaningful, experiential spaces. You can read more about brightspot's new office here.